Chocolate Truffle Recipe | Just The Right Spice! 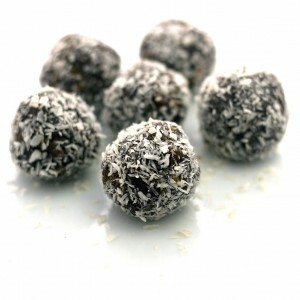 These chocolate truffles are sinful little candies that are simple to make. I usually make this recipe for special occasions and holidays. I planned to publish it for Valentine’s day but some how didn’t so here it is in plenty of time for Easter. Sift together cocoa and 1 and 3/4 cups icing sugar. Cream butter and extract, gradually add cocoa mixture blending well. Scoop small bits of truffle filling with a teaspoon (one to two bite sized) and roll in coconut or chopped nuts to form a ball. Arrange truffles in a single layer on a cookie sheet lined with parchment or wax paper and place in the fridge until firm. Transfer the chocolates into a covered food storage container and store in the refrigerator until serving time. Or you might want to hide them in the freezer other wise they may magically disappear! You’ll find my favorite extracts to make these delightfully simple chocolate truffles here. These truffles would make lovely little Easter eggs, and we always have them at Christmas. What other holidays would you make them for?